Interested in incorporating a farm-style kitchen in your home, but unsure where to start? 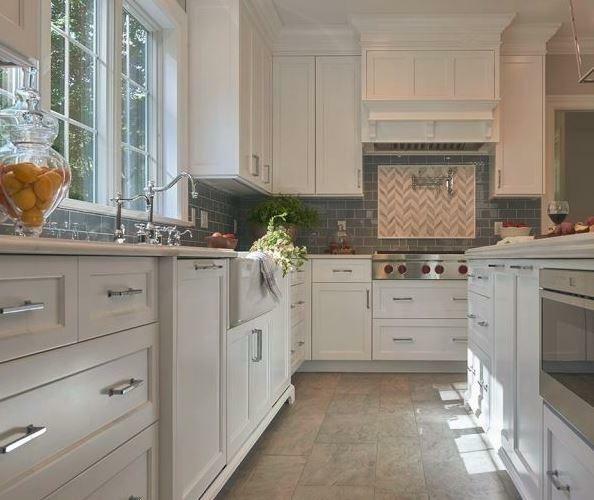 Craig Allen Designs in Midland Park, NJ stimulates your imagination with five must-have aspects of any farm-style kitchen. Many would argue that the sink is the focal point of any farm-style kitchen design. The classic farmhouse sink has a deep, wide basin that’s big and hefty, large enough to hold and rinse vegetables and other produce, pluck chickens and anything else that features in a full meal for farm hands or a large family gathering. 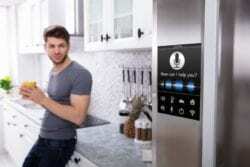 And afterwards, the sink’s size is vital for accommodating all manner of dishware, flatware, glasses, pots and pans, and more, so that everything can be cleaned efficiently. Keep in mind that, in addition to washing dishes, these sinks were used for canning / jarring the garden bounty, plus giving baby a bath. You could say the term “multi-tasking” originated with the farmhouse sink. Farm sinks come in a variety of materials, mostly fireclay and cast iron, but they can also be made from copper, zinc and stainless steel, among others. This type of sink is often called an “apron front” sink because of an extension that drops down in front of the sink. Today’s homeowners favor farm sinks for their timeless good looks and have them installed in new kitchens in lieu of the classic deep-basin sink. These sinks are both charming and utilitarian. And their design evokes nostalgia for simpler times. The design and style of a kitchen’s table and chairs goes a long way to confirming whether a kitchen is truly farm-style. Premium woods, like maple, oak, cherry or pine, are often used in their construction, which also features tight joinery and fittings. Some include artisan detailing, like the turned legs shown in the photo. Pine is an especially good choice for table construction because of its knotty texture and rustic appearance. 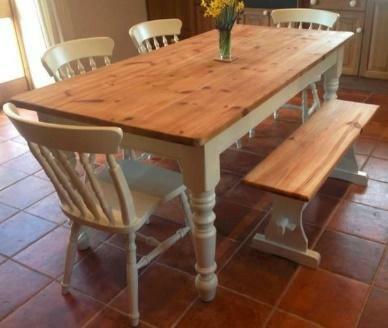 A classic farmhouse table-and-chair set is a must-have for people going for the authentic farm-style kitchen look. The table and chairs should offer a generous amount of seating — either bench-style or individual seats — so family and friends can comfortably gather. Adorn the table and chairs with fabrics and patterns that were popular in farmhouses of old: toile, chintz, gingham, and plaid are all good choices for tablecloths, seat cushions, and placemats. 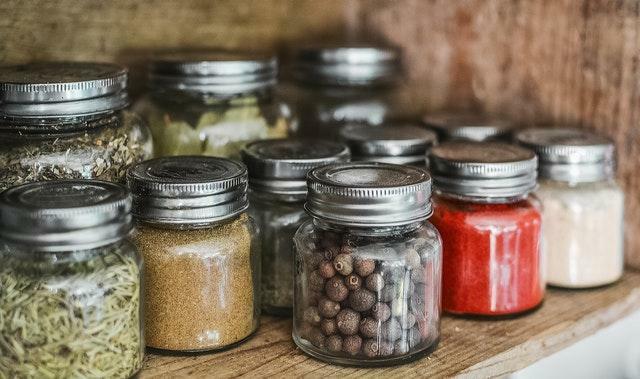 Nothing says “farm-style kitchen” quite like a nice set of mason jars, and it’s a virtual must that your kitchen includes a set for storing spices, grains, flour, sugar and whatever else you want to keep handy and display attractively. These multi-purpose country staples can also be used as drinking glasses or vases for showing just picked wildflowers. 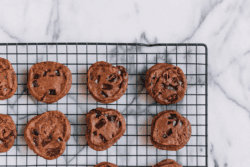 For flatware, the simpler the design is, the better – and anything that incorporates a wooden handle is a bonus when looking to achieve a rustic feel. On the walls, consider pastoral artwork, while countertops and end tables look great with well-placed antique farm implements. 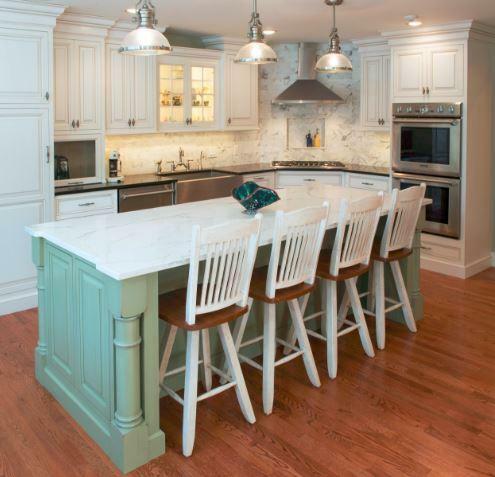 Most designers agree that white painted cabinets are ideal for creating a genuine farm-style kitchen vibe. But any neutral color, like cream, beige and gray, all work well. And you can take the design one step further by incorporating antique features like fluted corners and heavy molding into your room design. 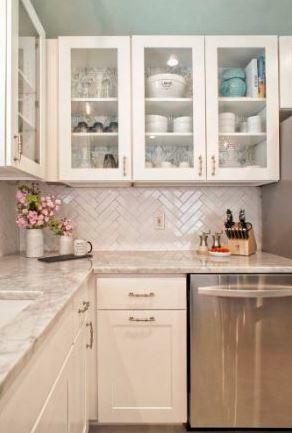 Another nice farm-style touch is to include a glass front and open shelving into one or more of your cabinets. Glass fronts never get old, and they’re a reminder that in the old days, glass cabinets were considered a luxury. Also in the old days, kitchens had nothing but open shelving for storing dishes. 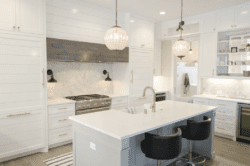 The resurgence of the farm-style kitchen has created a demand for open shelves. What’s old is new again. Back when farming was the backbone industry for much of the country, the kitchen table was used for cooking, food preparation, and eating. Today’s lifestyle makes this impractical, thus the kitchen island becomes an important asset, as well as a stylish addition to a farm-style kitchen. 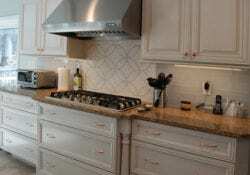 Island countertops can be wood, marble, granite, quartz or soapstone. One of the natural stones can contribute to the authentic look. Pair a hard-working island with stools that are metal, upholstered, or best of all, wood, which can be hand-painted for a truly unique farm-style look. Craig Allen Designs looks forward to assisting you with your next project. Contact us today and let’s create something memorable together.